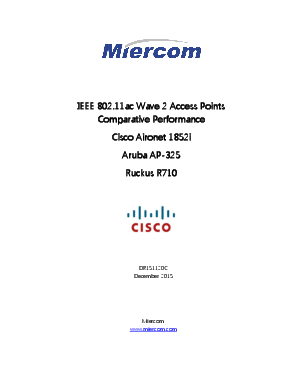 Miercom was engaged to perfirm independent, hands-on, comparative testing of competitive IEEE 802.11ac Wave 2-based WiFi Access Points (APs) from Cisco Systems, Aruba Networks and Ruckus Wireless. - Client density: Downlink throughput as the number of client per AP scales from 10 to 100. - Single vs Multi-User MIMO: Downlink throughput for MU-MIMO (Multi-User, Multiple-Input Multiple-Output), a hallmark of 802.11ac Wave 2, vs Single-User (SU-MIMO) environments. - 1 Gbps+ Link Aggregation: Tests found that Wave 2 APs can support more than 1Gbps of aggregate downlink throughput, tested over two 1-Gbps LAG (link aggregation) connections.